Does “Imperial March”-ing make you hungry? When you come home after a long day searching for droids, do you need a snack? Well look no further Jedi, Wookies, Ewoks, stormtroopers, bounty hunters, Jawas, Banthas, Ganks (I could do this all day), and stuck-up, half-witted, scruffy-looking Nerf herders! 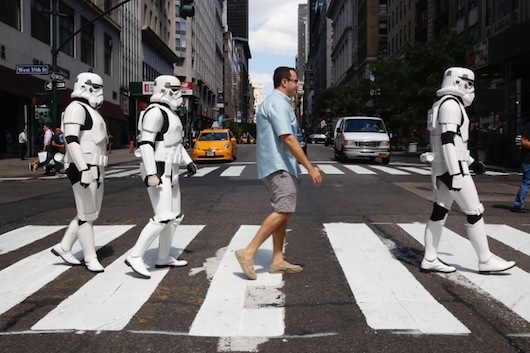 The face of Subway, Jared Fogel, and members of the Boys & Girls Club of Bridgeport, CT, (home of the first Subway ever) joined some Star Wars Stormtroopers who happened to be in the neighborhood, to celebrate twofold on Thursday, August 28, 2014, in New York City. It’s Subway’s 49th birthday this year, so they brought some of their friends from the Club where they started to promote Disney XD’s new Star Wars: Rebels series. For the months of September and October, fans can stop into SUBWAY to receive a special Star Wars: Rebel bag, free with every kids meal purchase!